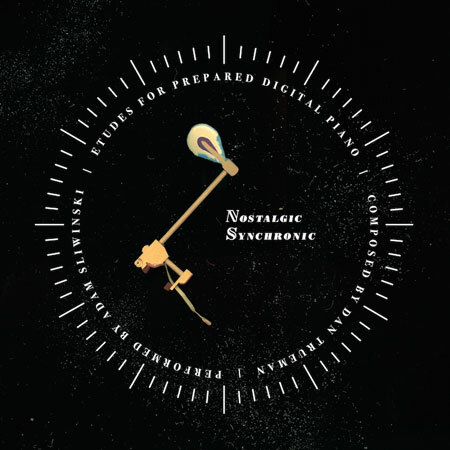 Containing three-quarters of an hour of room-clearing (except for you and I, of course) digital piano prepared with special effects with nary a conventional melody to be found, Nostalgic Synchronic is a set of eight icy etudes chock-full of high-pitched pinging and percolating notes, woozy melodies, skittering arpeggios and rumbling dissonance. One might think of it as some sort of a nostalgic digital update of Conlon Nancarrow’s player piano, John Cage’s prepared piano and La Monte Young’s The Well-Tuned Piano, although Nostalgic Synchronic doesn’t sound too much like any of them. Fans of those three artists may well want to investigate. You are currently browsing the archives for the Dan Trueman category.